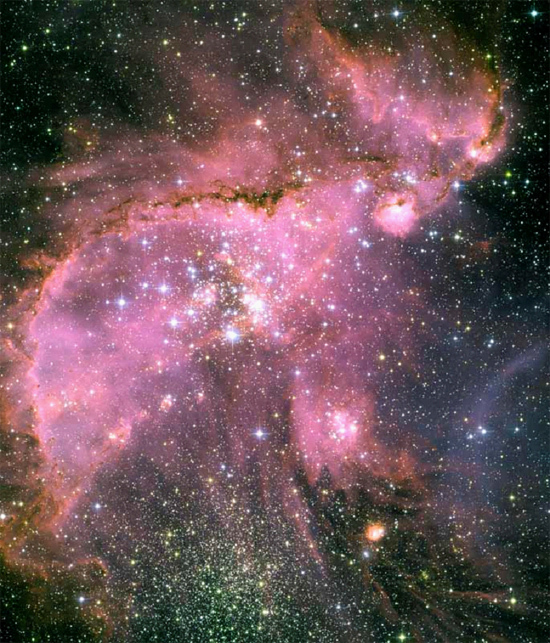 “Young stars” in NGC 346 within the Small Magellanic Cloud. The nebular hypothesis is brought out once again to explain how stars are born and age. In 1755, the German philosopher Immanuel Kant proposed that the Sun and the planets of the solar system were originally formed out of a cloud of dust and gas floating in space. Over eons of time, the cloud condensed because the gravitational attraction between particles caused them to clump into larger and larger lumps. Each lump became the center of even greater attractive force, drawing them all together and causing them to cluster into a mass. The mass gradually attained so much gravity that it squeezed the gases and dust down into a small, hot ball. As the ball became hotter and began to rotate from the angular momentum contained in the original cloud, it attracted more and more material into its mounting gravitational field, until finally igniting in a nuclear fusion reaction. The hypothesis fails to explain how the planets possess about 97% of the total angular momentum in the solar system when their combined mass is less than one-tenth of one per cent of the Sun’s mass. Some astronomers have attempted to boost the theory by suggesting that the Sun has an undetected companion star on a long, parabolic orbit that takes it beyond our instruments. This binary companion supposedly makes up the missing inertia that deflates the nebular hypothesis. In the early 1900s, the tidal hypothesis was suggested as an alternative, though it requires a catastrophic encounter with an unknown star from outside the solar system. Billions of years ago, says the theory, the Sun passed close enough to another star that a portion of the stellar material from both was pulled out. The solar plasma cooled while it entered orbit around the Sun and slowly formed the planets. In that way, the problem of angular momentum is solved by the action of another star. An announcement from the European Organization for Astronomical Research in the Southern Hemisphere (ESO), states that stars have been captured “feeding” on the protoplanetary discs out of which they are said to be born. The Very Large Telescope Interferometer (VLTI) used high resolution spectroscopy and interferometry to take images of dust falling into stars as well as a “wind” from the nebular disc, implying that material was also being ejected. Dust has been observed moving through nebulae, but until now the kinetic motion of the component gases has not been visualized. As the news release states, astronomers have found evidence for matter falling into the star in two cases, and for mass outflow in four other stars. More analysis is needed to determine what is causing the two different conditions. Dust has also been observed so close to one star that it should have evaporated long ago. Since the dust remains in orbit, the conclusion is that gas somehow shields the dust from the star’s energy. The new studies have not answered any questions about the nebular hypothesis and the tidal variant. All of these measurements are not designed to test the nebular theories, they are designed to discover what mechanisms are involved. No one questions the theories themselves, only how they are expressed in various environments or with varying degrees of energy input. None of these star systems are well-explained by various nebular theories. It is time to develop a new theory. This new theory should take into account that most of the universe is made of plasma and obeys different rules than a gravity-only universe. The new theory should consider that the gas giants and their moons were formed as separate systems. The new theory should also take into account the possibility that our solar system (and presumably others) has experienced a history of catastrophic cosmic births and changing planetary orbits.